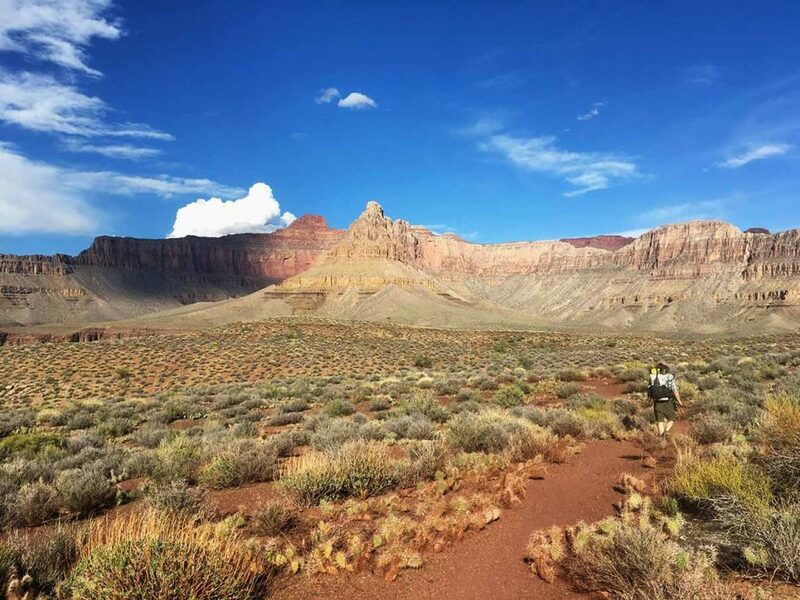 Follow in the footsteps of a Grand Canyon legend and hike the Boucher trail on this challenging Grand Canyon backpacking trip. 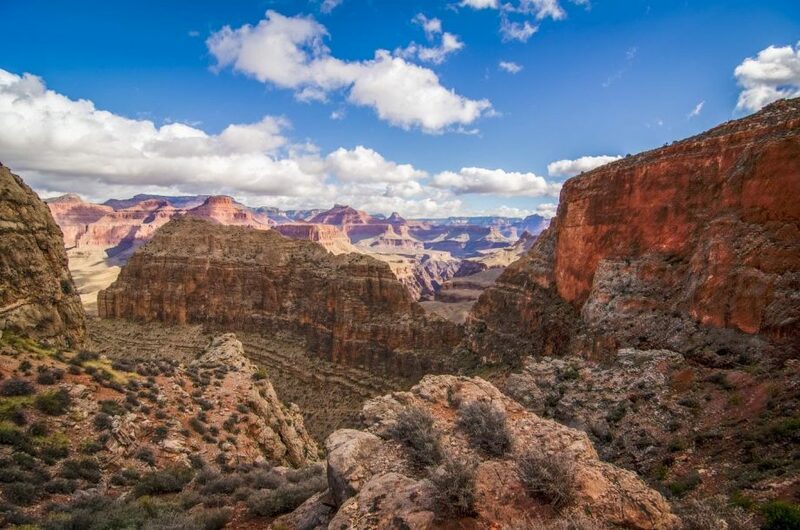 Visit some of the most remote depths of the canyon that can be accessed from the South Rim. Louis Boucher, the “hermit” of the Hermit Creek basin, was a fixture at Grand Canyon Village around the turn of the 20th century. Mislabeled as a hermit, Boucher spent his days isolated in the canyon in search of silver ore, but he was actually quite sociable and served as a tour guide for those who wanted to venture away from the bustle of Grand Canyon Village. Take a journey along the Boucher route like those early explorers did and descend one of the most demanding – and rewarding – trails in the park. 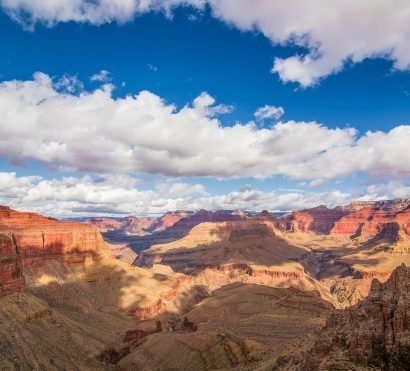 Solitude and dramatic inner canyon views highlight this trip, which includes camping along two different perennial streams, a rarity along the south side of the Grand Canyon. 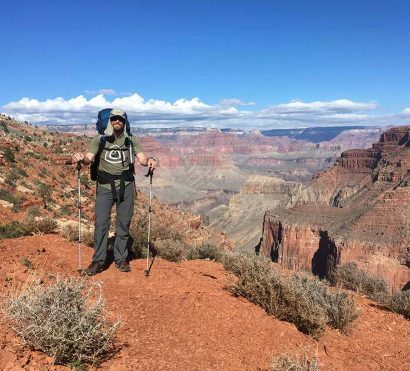 Backpack the Grand Canyon from Hermit’s Rest, an iconic architectural landmark on the South Rim, down the famous Hermit Trail and on to the Boucher Trail down to the Colorado River on this 4-day backpacking trip! This lollipop-style route travels the entire length of the Boucher Trail to Boucher Creek, the location of one of Louis Boucher’s seasonal residences at Hermit Creek Basin. This is one of the most rugged routes into the Grand Canyon and accesses one of the deepest points possible to reach from the South Rim. 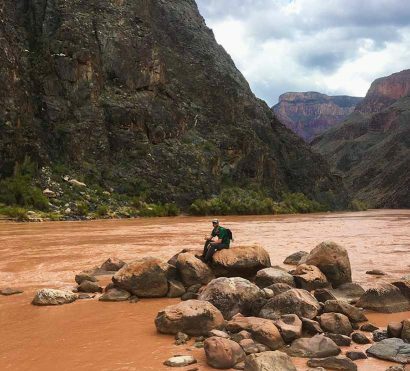 A day hike to the Colorado River gets us up close and personal to Boucher Rapid where we can watch for rafters. We continue our hike across the Tonto Platform, where stunning canyon views never disappoint, over to Hermit Creek for another night of camping. We hike out to the rim on the Hermit Trail on our final day’s hike to complete our loop and return to Scottsdale. Trip Start: Meets in Scottsdale, AZ at 5am on day 1. Trip End: Drops off in Scottsdale, AZ between 7 – 8pm on day 4. 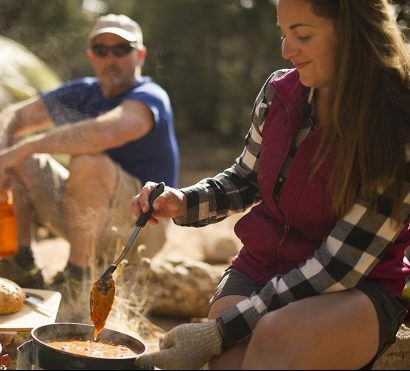 Meet your guides in Scottsdale, AZ on day 1 and transfer to the Grand Canyon for our epic adventure! We begin the 2-day descent to the bottom of the Grand Canyon at Hermit’s Rest. The first leg of the hike passes through pinyon-juniper woodlands as you traverse the sloping rocks of the Toroweap formation. Look for fossilized reptile tracks in slabs of rock alongside the trail, they are more apparent here than on any other trail in Grand Canyon. At about 2.5 miles, we officially set foot on the Boucher Trail and begin the traverse to the west side of Hermit Creek Canyon. Depending on timing and group pace, your guide may elect to visit Dripping Springs, a seasonal spring that was the location of one of Louis Boucher’s residences. The first night’s camp is high and dry just below Yuma Point on top of the Redwall limestone layer of the canyon. 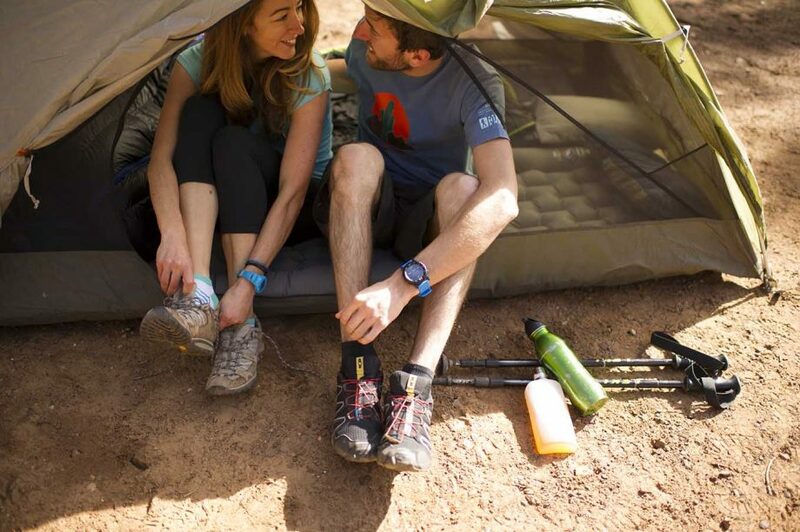 Rest up tonight, tomorrow is a strenuous day with some steep hiking – even by Grand Canyon standards! Today we have a challenging trek into the remote depths of the canyon. 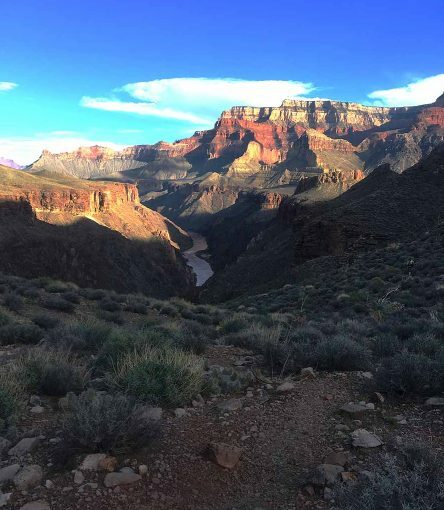 The Boucher Trail is one of the most difficult and demanding trails on the south rim of the Grand Canyon, and we’ll see that firsthand today! Upon leaving camp, we continue the traverse at the top of the Redwall to a small side canyon that cuts through this rock layer. The Redwall limestone, which averages 500 feet in thickness, is the most notorious layer in the canyon and the most difficult through which to build a trail. The steepest sections on any Grand Canyon trail are usually through the Redwall, and the Boucher Trail is no exception. We’ll take our time using 3-5 points of contact with the ground at all times to down-climb in the safest way possible. Once through the Redwall, there is some respite with a flat(ter) traverse to White’s Butte. After a scenic rest break, we continue down another steep section into Topaz Canyon and Boucher Creek. Any one of numerous campsites near the creek will serve as home tonight. Depending on timing, pace, and group desire, your guide may choose to hike to the Colorado River and explore Topaz Canyon (without packs). 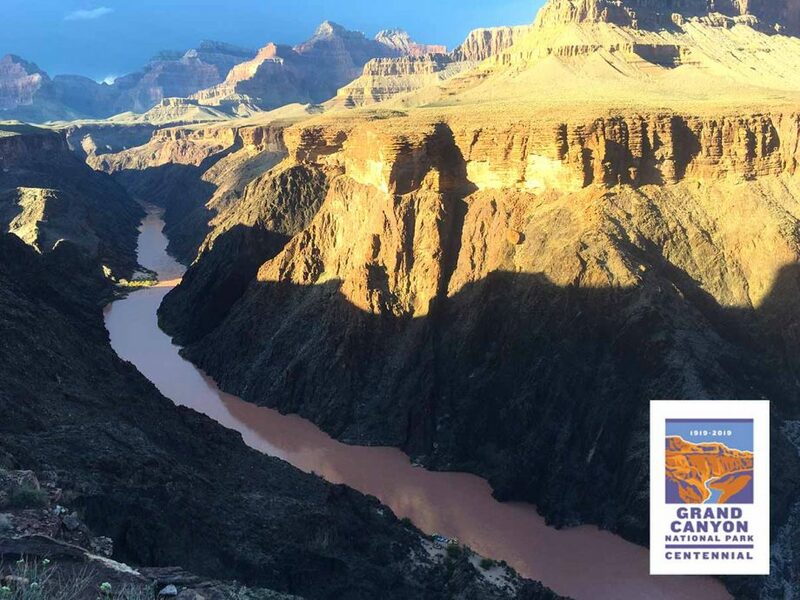 Don’t worry if we don’t get there today, there will be time the following day to get an up-close look at a Grand Canyon rapid! *Note: while the section of trail through the Redwall is very steep, it is by no means rock climbing. Many people prefer to use trekking poles in conjunction with hand-holds for stepping down steep, step-like rocks. Compared to the previous 2 days, today’s hike will be a walk in the park. After a delicious, casual breakfast, and a possible hike to the Colorado river, we break camp and backtrack slightly up to the Tonto Trail. While the Tonto has its fair share of difficult aspects for backpackers, vertical challenge is not one of them. The rolling terrain and open skies in this section of trail offer some of the most spectacular views of the trip. As you hike, spend your time searching for rafters on the river and gazing across the canyon at the Tower of Ra and Shiva Temple. After a scenic lunch stop on the trail, we’ll proceed back to Hermit Creek Canyon and tonight’s campsite. 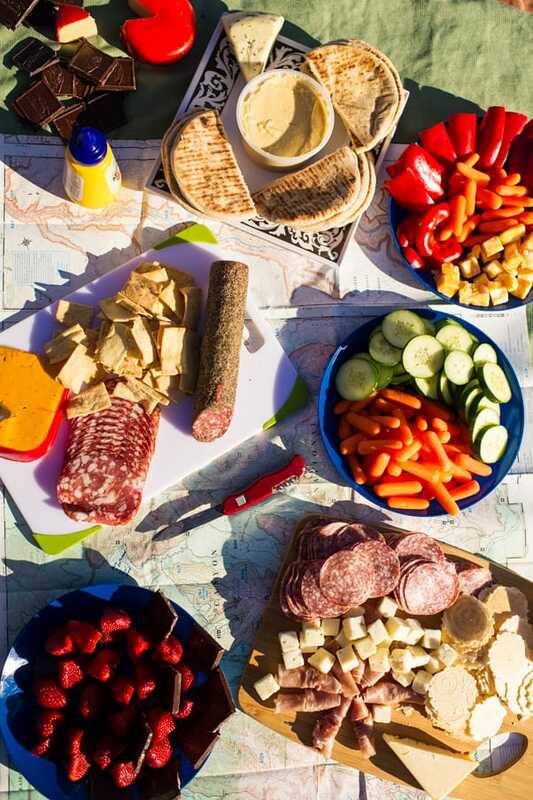 We’ll settle in for another delicious dinner prepared by your guide and enjoy one last night at the bottom of the canyon. Today we will rise early to take advantage of the cool morning air on the long hike out. The ascent back up to the South Rim is a special experience after 3 days in the remoteness of the canyon. It is commonly thought that hiking up is harder than hiking down, but at the Grand Canyon, you may likely find that the opposite is true. As always, we take our time and ensure we keep a good pace for the entire group. At every rest break, you’ll look around and realize that each sweeping view is colored subtly by your experiences over the last three days. Back at the rim we will take a short break to allow all that you’ve accomplished over the past 3 days to sink in before heading to Grand Canyon Village for lunch and then back to Scottsdale. A good night’s sleep tonight will be well deserved as your Grand Canyon vacation comes to an end. 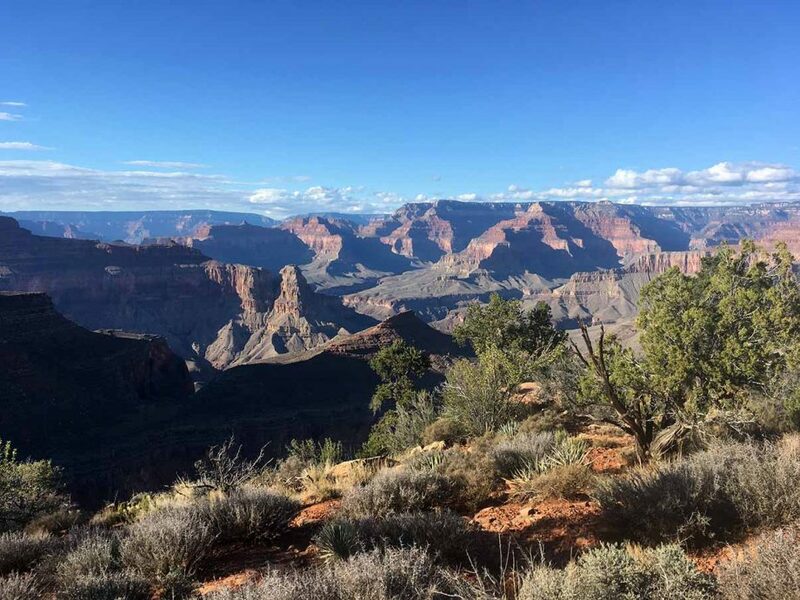 Cell service & Electricity: While backpacking in the Grand Canyon, you will not have cell phone service, you should expect to be unreachable by phone. There is no electricity available. Bring a portable battery to charge your phone for photos. This trip travels the entire length of the Boucher Trail, which contains some of the most demanding sections of established trail in the park. While not true rock climbing by any means, these sections will likely require the use of your hands for safe and successful down-climbing.